Madhwesha Vittala Dasa was a disciple of Vijaya Dasa. He was earlier known as Kondahalli Madhwacharya. He visited Udupi and composed the incomparable Udupi Krishna Suprabhata, which is played at the Sri Krishna temple every morning even to this day. This is one of the finest composition on Krishna and there is harmonious match of Sahitya and Sangeetha. The composition serenades Krishna and it is full of devotion. A devotee of Raghavendra Swamy, he has many compositions on the seer of Mantralaya. This is one of his popular compositions on Rayaru. The lyrics of this composition are in Kannada. One of the many bidi sanyasis who preferred to remain out the Matha fold and worship Raghavendra Swamy is Vasudeva Vittala Dasa. Vasudeva Vittala Dasa is the ankita of Vyasa Tatvajna (1704-1800) who was born as Venkataramana. Though people prefer to call him Vyasa Tatvajna Theertha, it should be remembered that he was bidi or freemoving mendicant though he was closely associated with the parampare of the Sri Raghavendra Swamy Matha of Mantralaya. He was born to Ayiji Venkata Narasimhacharya, a great Madhwa scholar. 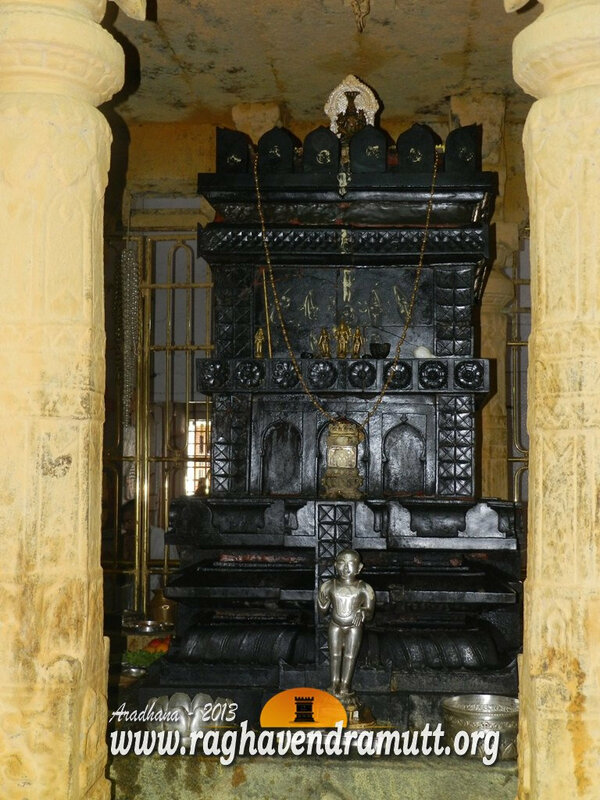 Venkata Narasimhacharya was a disciple of Bhuvanendra Theertha of Raghavendra Swamy Matha. He had also mastered the Sudha Pata. Venkata Narasimhacharya and his wife regularly interacted with Haridasas and his wife often sang their compositions. One day, Venkata Narasimhacharya found his wife singing a beautiful composition of Gopala Dasa. Though the composition remained in the mind of Venkata Narasimhacharya and he was deeply impressed with the Devara Nama, he thought it was below his dignity to meet Gopala Dasa or interact with him. By then, he had mastered the Sudha Pata and he looked down on anyone would had not read or mastered it. “What can Bhaganna, the earlier name of Gopala Dasa, tell me that I do not know”, he asked. However, one day he was forced to go and meet Gopala Dasa to know the future of his son. Gopala Dasa asked Venkata Narasimhacharya not to worry and forecast that his son, Venkataramana, would become a great scholar. Soon, Venkataramana became a scholar and subsequently a disciple of Bhuvenendra Theertha of Raghavendra Swamy Matha. Gopala Dasa advised him to take sanyasa and Venkataramana became Vyasa Tatvajna Theertha. However, Vyasa Tatvajna Theertha continued his association with Gopala Dasa. He sang and danced with him and this was not to the liking of Bhuvenendra Theertha. The seer warned Vyasa Tatvajna Theertha that he would succeed on the Peeta and that he should behave in a dignified and restrained manner. Vyasa Tatvajna Theertha, also known as IG Swamigalu or Aijee Swamigalu, then preferred to remain out of the Matha Parampare and continued his interaction with Gopala Dasa. The seer stayed on at Venisomapura, which is about 75 kilometers away from Mantralaya. Venisomapura is in Andhra Pradesh and it is downstream the Tungabhadra. Venisompura was also affected by the flash floods of the Tungabhadra in 2009. The Brindavana of Vyasa Tatvagna Teertha along with the two temples of Lakshmi and Venugopala Swamy were fully immersed in water for more than 24 hours. This place is also called as Chyavanakashrama. It is here that Vyasa Tatvagna Teertha entered Brindavana. To reach Venisompura from Mantralaya, one has to cross the Tungabhadra and pass through Ieeja and Chinna Tandrapad in Mahaboobnagar district, adjoining Kurnool district. A great devotee of Rayaru, the seer of Venisomapura has some excellent compositions. Here are two of them. The Mantralaya Sri Raghavendra Swamy Matha has come up with a plan to rebuild the sanctum sanctorum of the holy Raghavendra Swamy Matha in Mantralaya. The plan of the highly venerated religious institution, the Mantralaya Matha, is to “rebuild the sanctum sanctorum of Shri Rayaru completely to create a covered stone structure with pillars in ancient architectural style”. The website of the Sri Raghavendra Swamy Matha, Mantralaya, and emails sent out to the subscribers of the matha newsletter states that the massive project is slated to cost about Rs. 10 crores. The Newsletter and emails of the Matha state that “His Holiness Shri Shri Suyateendra Theertha Shripaadangalavaru has undertaken a commitment to rebuild the sanctum sanctorum”. It says though the Matha is capable of constructing the stone pavilion, both the Swamiji’s (this means the senior and junior pontiff of the Sri Raghavendra Swamy Matha) wish is to present the unique opportunity to all the devotees to make a contribution towards this project and be blessed. It says Sri Subudhendra Theertha has taken over the leadership of the project. The value of each stone slab that will be used in the construction of the stone structure is estimated to be Rs.5000. Every stone slab used in the construction of the interior enclosure around the Brindavana may be sponsored by devotees. 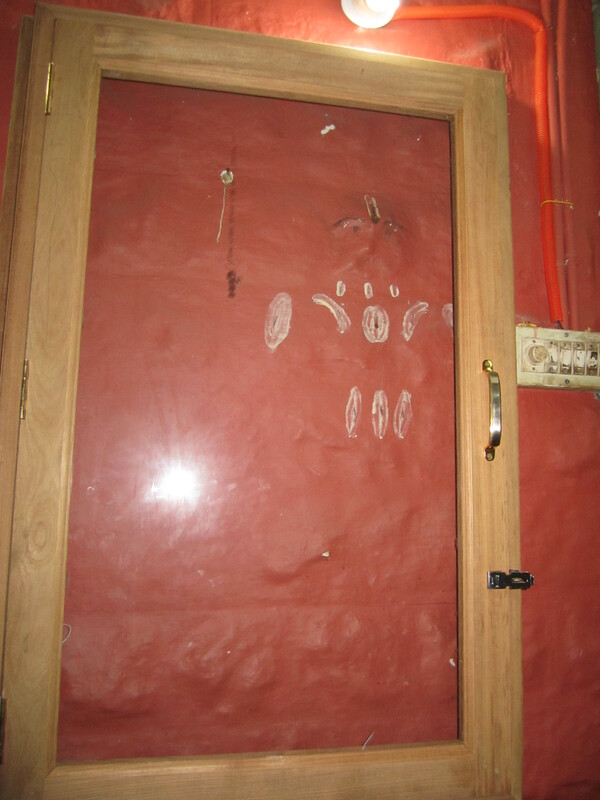 Each stone slab donated by the devotee will be offered only after taking their names in the Sankalpa. A devotee may donate any number of stone slabs. Every donor will receive a commemorative memento from the Swamiji along with his blessings. After constructing and offering the Stone Mandap to Rayaru, the surplus funds thus accrued will be utilised for the new building construction of Shri Gurusarvabhouma Samskruta Vidya Peetha. Cash donations will be accepted only through authorised representatives or at the Donation Counters at Mantralaya. The matha says online funds may be transferred to the account given below. This donation is eligible for tax concession under Section 80G of Income Tax act. There are scores of Mathas dedicated to Raghavendra Swamy in Bangalore. While a few such as the one in Jayanagar 5th Block and Seethapathi Agrahara are managed by the Mantralaya Matha directly, others are private and a few run by trusts. All the Raghavendra Swamy Mathas in Bangalore are popular and there is good crowd of devotees on Thursdays, holidays and of course the three days of Aradhane of Rayaru. The mathas are known in the Brahmin community for providing facilities for celebrating family functions, festivals, birthdays, shanti and other religious and social functions. However, in the last few weeks, one Raghavendra Swamy matha in Bangalore has been making news. This is the Matha at Kalyani Gardens in Ashoknagar just off Thyagarajanagar and it is popularly called the Kalyani Raghavendra Swamy Matha or the Sathyabama Seethamma Kalyani Sri Raghavendashrama. The Kalyani Raghavendra Swamy Matha it is located next to the Madhwa Patashala and both are easily visible from the road. 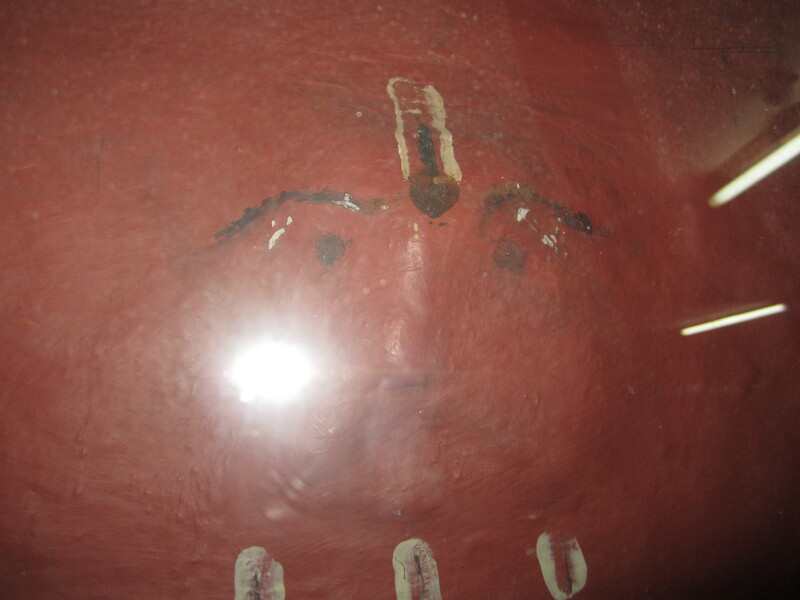 The Matha has been drawing visitors and devotees because of a unique phenomenon. An image of Raghavendra Swamy is manifesting itself on the left outer wall of the Prakara housing the Brindavana of Raghavendra Swamy. The image is slowly becoming more and more visible each day and the outlines of the face with eyes and nose can clearly been seen. 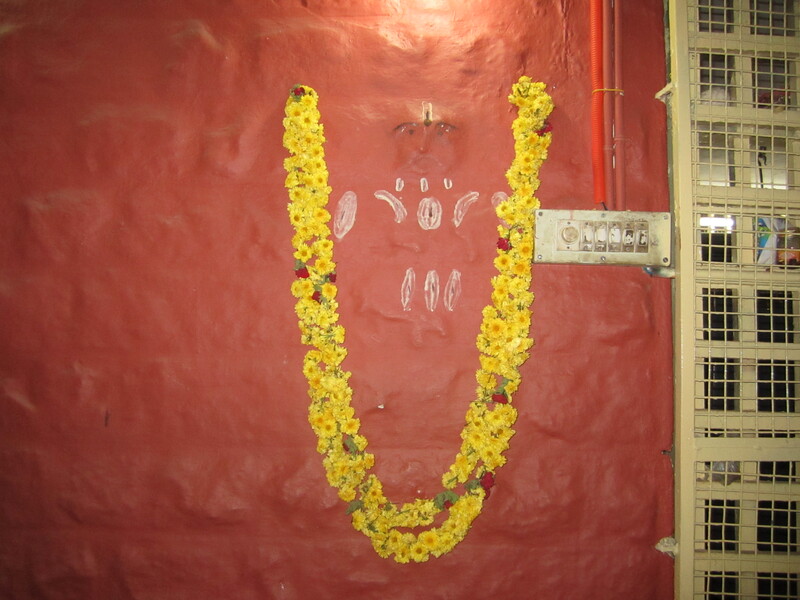 There is no doubt that the image on a wall is that of our beloved Rayaru. Till a few days ago, the image was left as it is on the wall. When the image was touched, the concrete surface was smooth than the rest of the wall. Many devotes and the priests there told us that when they reverentially touched the image, it felt soft. 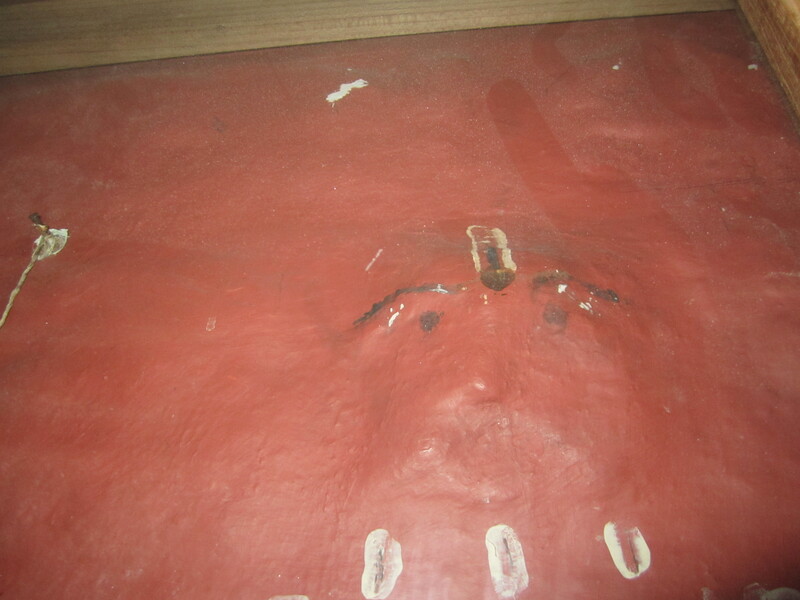 The image is developing by the day and as many people were touching it, the temple management decided to protect it by encasing it in a wooden frame with a glass front. So if you go to the Matha, you can see the outlines of Rayaru through the glass. 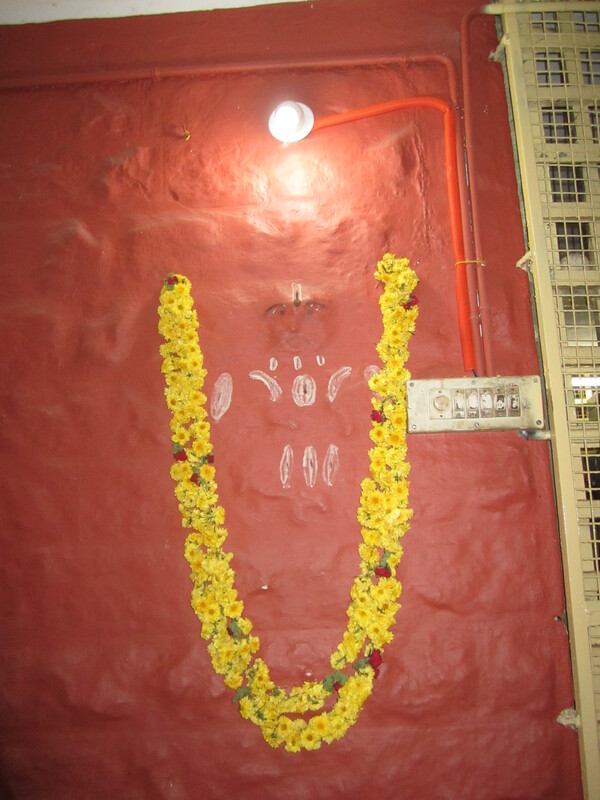 This is perhaps the first time in Bangalore that any such image of our Rayaru is manifesting on its own. The Kalyani Rayaru Matha is one of the oldest in Bangalore and it was established almost 70 years ago. According to some devotees and localities, it was Mrs. Seethamma and Ananda Tirthachar Kalyani who had built the Temple, performed Pratishtha and Utsarga of Raghavendra Swamy at this very place (where the Brindavana is located) in 1942-43. The KalyaniGardens is a small industrial area that lies between Banashankari 1st Stage and N. R Colony. The temple of Raghavendra Swamy is off the 6th Cross and one can easily access this road from Chennammana Kere road and from Vidyapeetha on one side and N.R. Colony-Thyagarajanagar-Ashoknagar on the other. The temple is located just off a 30 feet road which is open to both way traffic. Since there are several industries, business and commercial establishments in and around the vicinity, the road has traffic. When we visited the temple first, the outline of Rayaru was only faintly visible but when we saw it two days ago, it was more clear as the following pictures will show. 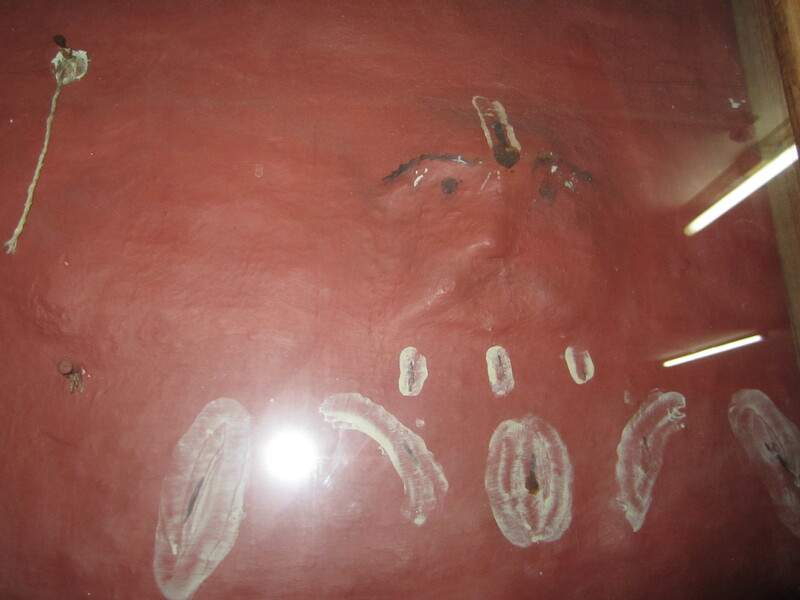 Now, the image is encased in a wooden frame with glass to prevent people from touching it. The photo is a little hazy as there is bulb burning constantly over the mage and its light falls directly on the image. So, here are some photos of the image and the Kalyani Rayara Matha. As can be seen, the outlines of Rayaru are forming on the outer left wall of the prakara housing the Brindavana. This is a beautiful composition on Raghavendra Swamy by Lakshmipathi Vittala. 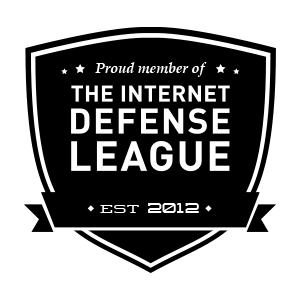 The style here is simple and the language too is easy to understand. The composition lists out the greatness of Rayaru and starts with the words that this is Raghavendra.